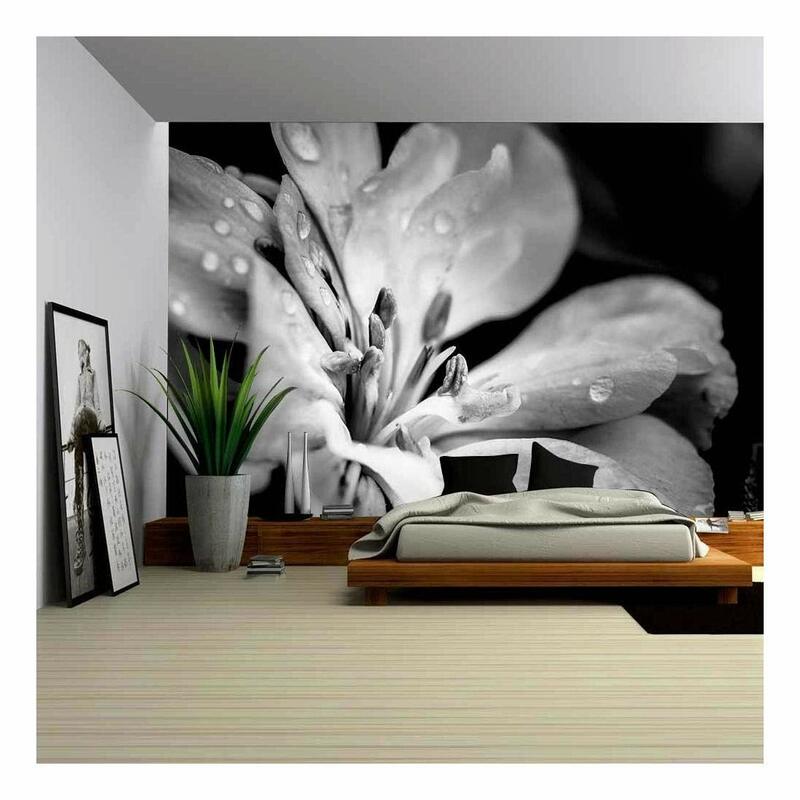 wall26 - Flower with Raindrops - Canvas Art Wall Mural Decor - 66"x96"
I love the picture on the sales advertising, The high quality is super! Make sure to follow the instructions on the bottom of the panel, if you wanted perfect 2 people need to apply it! I purchased for my living room wall. I have a lot of wood panelling that I am not sure what to do with. This installed easily. Just peel and stick. I messed up one panel and had to pull it off and reapply. It still holds like other panels. Did not hurt wood to peel off and reapply. Looks great! The pic came in 6 panels and I only used 4 panels. May use extra in another room in the house. Has been on wall for about 2 months now and looks beautiful still. It is the focal point of my living room. Excellent! Beautiful photographic image. Easy to put up once I asked a professional how to apply it. I applied mine to glass, so a simple solution of water, alcohol, and soap sprayed on the glass and back of the image made it so simple I felt like a professional. It literally took about 5 minutes per panel using this method with absolutely no air bubbles and a perfect line-up. I LOVE it!! I love my wall art. The color is exactly what I wanted. It is not purple it is a mauve color. I put it up myself and it was easy. I do have a textured wall and it sticks fine. U just have to really go over it with a close fist to make sure it has good contact with every piece of the wall. Definitely dont be afraid to pull down at least 5 or 6 inches of the backing to start lining it up with the wall. Any less will give u problems and frustration. I look forward to buying other designs for the rest of my home. I had to cut 10” off to fit my wall and that was easy! It also wows my visitors!! Exactly as described!!! Nice wall mural. The detail in the image was good and it had no problem sticking to the surface. Be aware that the backing paper tears rather easily which makes it tricky applying to corners or non-flat surfaces. No strong odors like other vinyl. Installing my poto mural was more challenging than I though. Definitely something you need 2 people for. The first roll was not installed straight and when I peeled the poster off to re-install it the wall paint came off with the poster I had to trash that roll. It got easier as I installed the rest of the rolls. Two things to know: 1) the rolls have a small overlap on the edges with each other which makes it easier to install (i didn't trim off the overlap and it is imperceptible. 2) The rolls don't match the image perfectly (I got the largest version of the image and it was slightly off) you can only tell when standing a few inches from it. Despite all that the mural looks incredible. I wish the vendor had some installation videos in YouTube. The beautiful look on Amazon is what I wanted, but I received something totally different. The flowers are not vibrant, but a dull plum pink color on plastic like regular contact paper, which would have been tolerable if the color was lavender as pictured. Anyway, I thought it would like better once on the wall. It sticks to itself quite fast, so you have to be careful as you put it up. Once up, I was still disappointed. Update: I was going to send this back, but after a few days it grew on me. I noticed that when the sun shines in the room, it appears purple, which is what I wanted. I will be keeping this mural.